It is really impressive how LONEWOLF have evolved through the years. At the start of their career they were a hidden secret between the underground metal fans. They were a band that through their own music were paying tribute to the great metal band RUNNING WILD. It seems though that LONEWOLF never intended to be tagged as a RUNNING WILD clone since from their first steps they tried to give to their compositions their own personal touch. 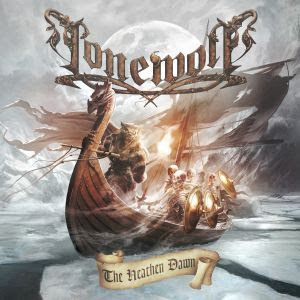 “The Heathen Dawn” is the title of their 8th studio album and here we witness that LONEWOLF have matured musically and although they don’t hide their influences, they process them and transform them into their own original compositions. Yes, they still have RUNNING WILD influences, but they are not so obvious and actually the songs that you will listen to here are 100% LONEWOLF. They have this raw and yet melodic sound which creates a pompous and epic atmosphere. The band manages to create songs that move from traditional heavy metal sing along songs to epic compositions. Besides the RUNNING WILD influences, on their new album someone experienced will also find references to bands like BLIND GUARDIAN and GRAVE DIGGER. I have followed the band from the start and I have to admit that I am very happy to see them progressing and creating songs faithful to their tradition and influences and yet being recognizable as 100% LONEWOLF. The fans of what we call Teutonic heavy/power metal will enjoy this release. Αναρτήθηκε από Nick Parastatidis στις 8:06 π.μ.